Today KMail has gained a new cool feature that has been repeatedly requested in the User survey last year as well as on forums and social networks: Unified mailboxes. 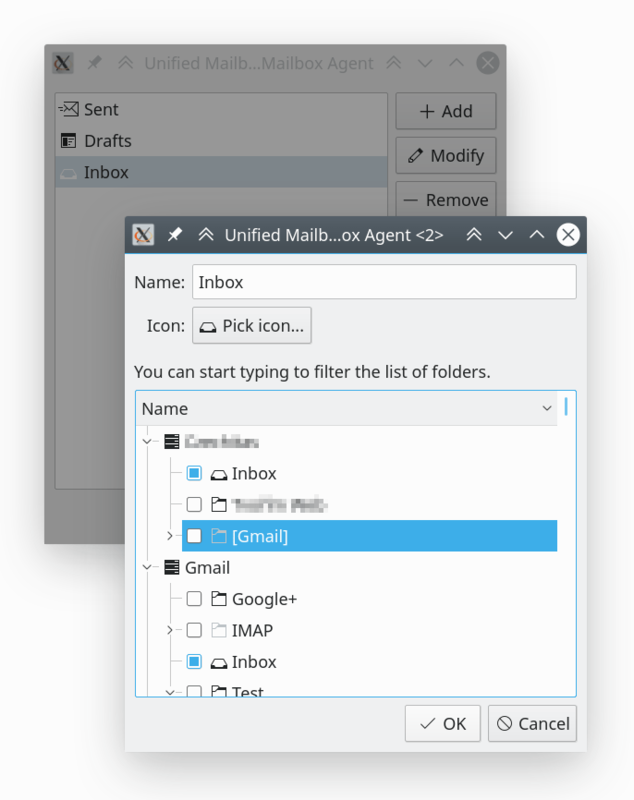 Unified mailboxes offer not only a unified inbox - a single "Inbox" folder showing emails from inboxes of all your accounts, it also provides unified sent and drafts folders by default. 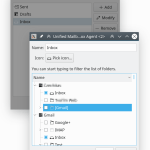 But we did not stop there: you can create completely custom unified mailboxes consisting of any folders you choose. 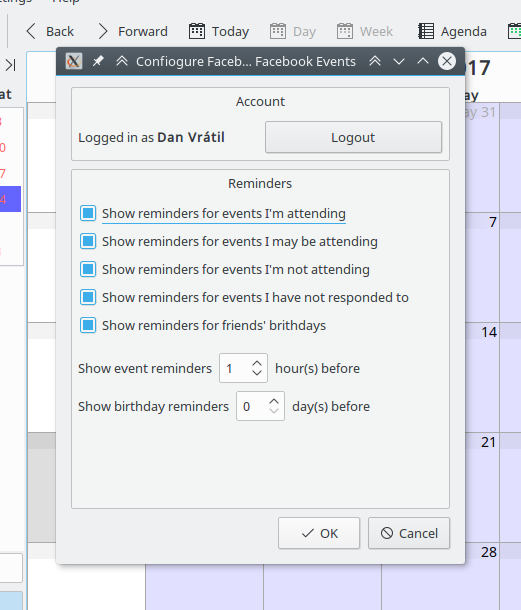 You can even customize the default ones (for example exclude an Inbox from a particular account). 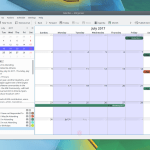 The feature will be present in the December release of KDE Applications. 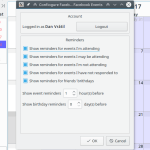 Do you want to help us bring more cool features like this to Kontact? This blog post is long overdue, but now that I'm back home from the KDE PIM Sprint in Toulouse, which took place last weekend, there's some more news to report. shut down Akonadi Resources when they are not needed and start them on-demand, thus saving some more resources. 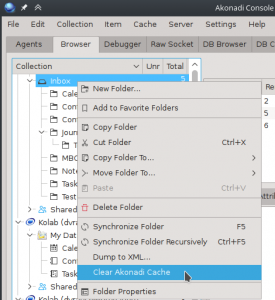 As I was touching the internal notification system in Akonadi I also improved the relevant debugging tools in Akonadi Console, our developer and debugging tool for Akonadi. Based on input from Sandro I also added Logs view. Thanks to that it's now possible to see debug output from all running Akonadi applications straight in the Akonadi Console without the need to restart Akonadi or the application from the terminal to see the debug output. This will make it easier for users to provide us with relevant information to help us debug and solve their Akonadi issues. This was just a minor change, but it finally solved my long-standing issue with Kontact and Breeze: the side-pane icons to choose between different Kontact modules were colorful - the only non-monochromatic part of Kontact which was so obviously not fitting into the rest of the UI. With a tiny change, the icons are now also monochromatic, making the Kontact window look more uniform. For a while now the IMAP resource supports logging into Gmail accounts using the so-called OAuth method, where you provide your credentials into the Gmail login window which also supports two-factor authentication. The IMAP Resources was forcing the OAuth method with Gmail for everyone, but this requirement has now been relaxed. Although the IMAP resource will choose this method by default it's possible now to also choose the traditional authentication methods like with any other email provider. Secondly, the OAuth support has finally landed also into our SMTP module which is used for sending emails, so if you select this method in your Outgoing account configuration with Gmail, you no longer need to use "App-specific passwords" from Gmail. The Syndication library is used to retrieve and parse RSS and ATOM feeds and is used among others by Akregator. 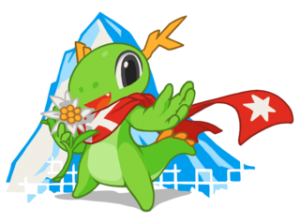 We have now cleaned up the library and removed some redundant dependencies so that we will eventually be able to move it into KDE Frameworks so that even more applications can benefit from it. 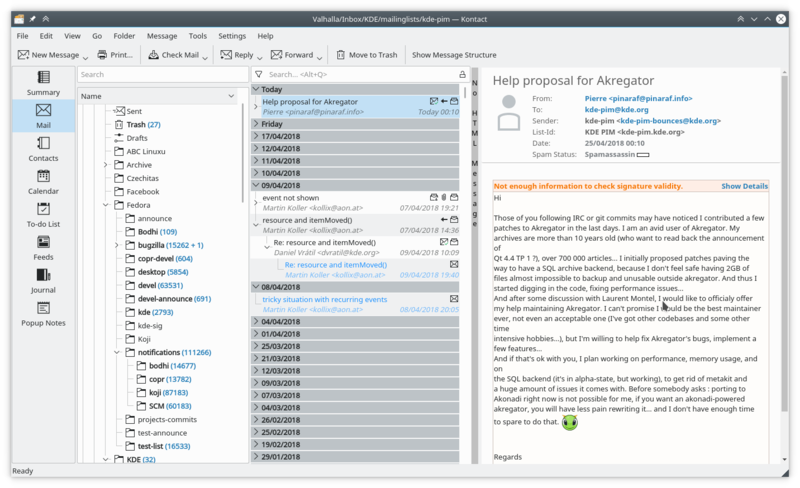 Thanks to a huge effort from Hannah we are now able to build Akonadi and other parts of the KDE PIM stack on Windows. While we are still a long way away from having Kontact properly running on Windows, we managed to get Akonadi to work on Windows with some other programs. Windows is a huge platform and Kontact with all its features and functionality could be a good competition to established PIM solutions there and a huge potential to grow our user and developer base. 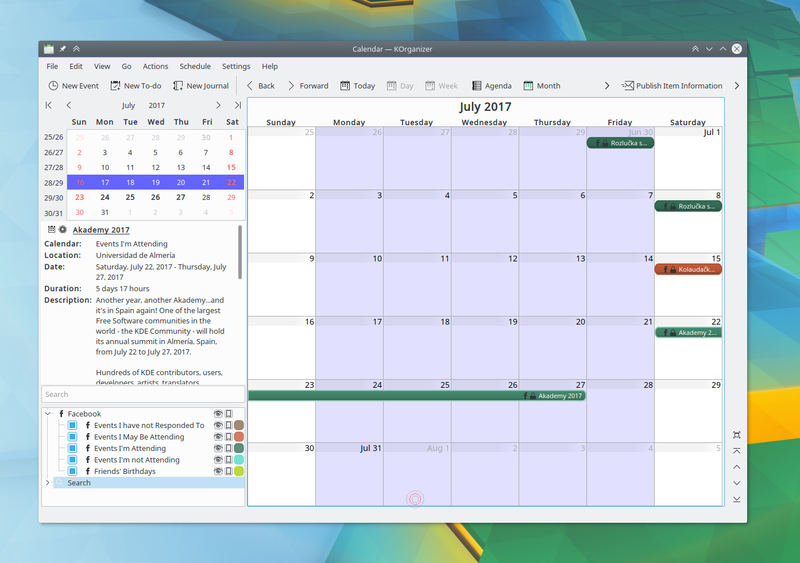 While we still focus primarily on Linux, we are slowly looking forward to extending our reach to Windows. A lot of them. Big thanks to David Faure who spent a big part of the weekend debugging his IMAP resource to figure out why it keeps getting stuck on occasions. He fixed several issues in the IMAP resource so that it properly reconnects after server connection is lost or times out (due to poor internet connectivity usually) and also found and fixed some issues in Akonadi syncing code. of smaller tasks and improvements to look into during the year. 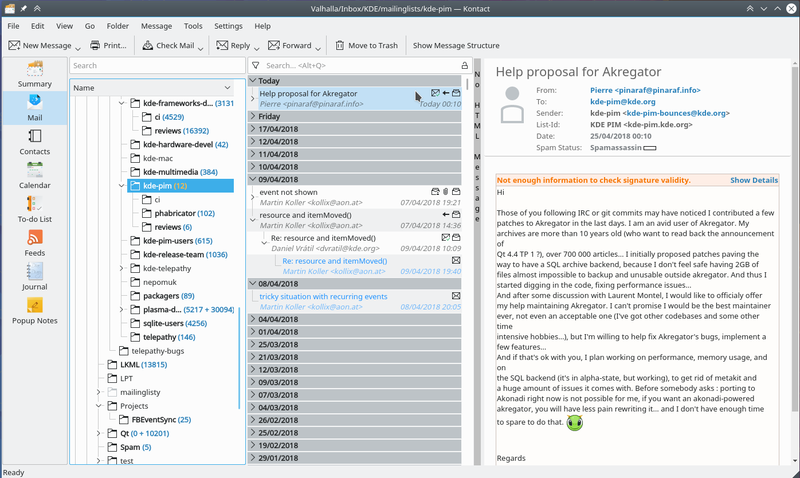 I'm sorry to bring bad news, but after trying to fight some last minute bugs in the new Gmail resource today, I realized that pushing the resource into KDE Applications 4.14 was too hurried, and so I decided not to ship it in KDE Applications 4.14. I know many of you are really excited about the Gmail integration, but there are far too many issues that cannot be solved this late in 4.14 cycle. And since this will probably be the last 4.x release, shipping something that does not perform as expected and cannot be fixed properly would only be disappointing and discouraging to users. 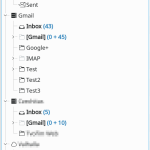 In my original post I explained that I was working on the Gmail integration to provide user experience as close as possible to native Gmail web interface so that people are not tempted to switch away from KMail to Gmail. But with the current state of the resource, the effect would be exactly the opposite. And if the resource cannot fulfil it's purpose, then there's no point in offering it to users. 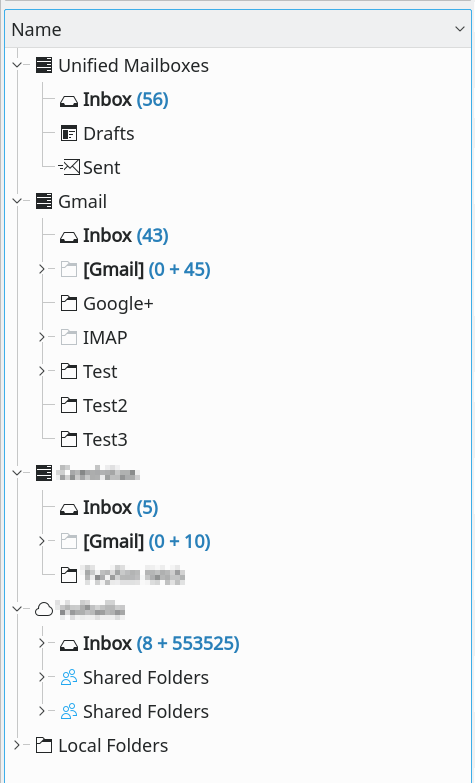 Instead I will focus on implementing the new native Gmail API and merging together the existing Google resources to create a single groupware solution that will provide integration will all Google's PIM services - contacts, calendars, tasks and emails.